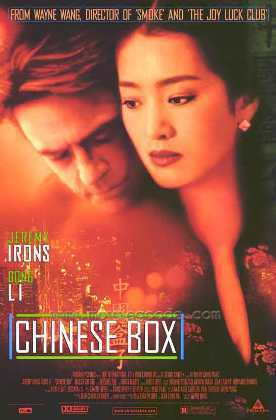 Chinese Box by Wayne Wang stars Jeremy Irons as John, a journalist living in Hong Kong in the months leading up to the handover of the colony by the British to the Chinese. He learns that he’s got leukemia and has approximately as long to live as the British presence in the territory will last. “I wonder if I can hold out longer than the British—not that I could be described as an empire,” he tells us in voiceover. But the rest of the film goes on to demonstrate, rather tediously I think, the proposition that he can be described as an empire. Similarly, the woman he loves, Vivian (Gong Li), who doesn’t love him but a rather nondescript Chinese gentleman called Chan can be described as a colony, just as Chan, a crooked businessman, can be described as the local power assuming control etc etc. The film is blessed with fine performances by Mr Irons and Miss Gong, some good photography and an intelligent and politically unstupid script that calls for particular plaudits. But somehow the overly schematic nature of the allegory is too off-putting. It gets particularly strained when Vivian, a former and perhaps current prostitute, begins to love John only as he starts to fade away physically. Although he wants to marry her, she finds that she can only express her love by meeting him in the role of the prostitute. Chan, meanwhile, can never marry her because “In the strict mores of Chinese society, the stigma of the past would prevent her from ever being an acceptable wife.” Instead, he tells her “I’ll always protect you” and agrees to pose for fake wedding pictures to send to her mother in China. The photography motif is one that is not tied in directly to the allegory. John's friend and roommate is a Latin American photojournalist called Jimmy (Ruben Blades) who finds a higher aesthetic truth in the sordid side of the city than in its beauty. John himself, though a financial journalist by trade has taken to roaming the streets of the city with a videocamera, recording interviews with people he meets in the street apparently for his own curiosity only. One of these street people, a scarred but still pretty young woman called Jean (Maggie Cheung), had attempted suicide as a schoolgirl when her English boyfriend's rich father had forced the breakup of their romance. She still believes that the boy will come back to her, though John improbably proves otherwise to her. In fact youth now hardly even remembers her. If this is meant to be another piece of the allegory, it seems to me rather to contradict the main one, since here China is the unrequited lover of England where there England is the unrequited lover of China. Likewise the presentation of the handover—and even, strangely, John's death—as media events gets in the way of the film's more serious points. Maybe we are meant to feel about this picture as John feels about Hong Kong: “Everything in this city has always been changing. Maybe I wasn’t meant to figure you out.” It's a lot of trouble to go to to reach the obvious and unarguable conclusion that it is very sad indeed to see this lovely city handed over to a bunch of thuggish communists. But the scenes from the actual handover are in context very moving, and one is somehow glad to have it all said again.